Today we bring you the latest installment in our feature, “What She Said…” in which we both review books that the other has already read and reviewed. The idea arose because of the dilemma that if one of us reads and reviews a book, the other can’t really post again about it, right? WRONG! Hence, “What She Said…” was born. For those books that we REALLY want to read after the other has reviewed – and gushed – about it. For today’s post, we take on The Magicians and Mrs Quent by Galen Beckett, and The Hundred Thousand Kingdoms by N.K. Jemisin. 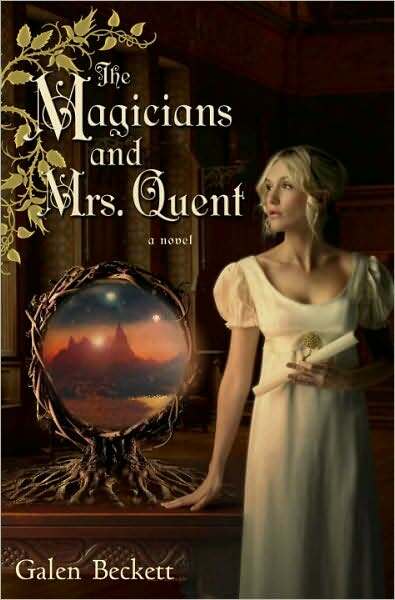 The Magicians and Mrs. Quent is s stunner of a debut novel, and one of the most engaging, well-rounded books I have read in a very long time. Simply put, this is a beautiful literary patchwork quilt, combining the humor of Jane Austen, the strength of Charlotte Bronte, and a unique fantasy voice that is entirely Galen Beckett’s own. One of the best books I have had the pleasure of reading this year, and I cannot wait for the forthcoming sequel. I always look forward to our What She Said posts. It is when I am allowed to pick any book I want to read an since that book would have been reviewed in depth by Thea I get to simply relax and have fun with it and then just report back. So far, my experience with the books I picked for the feature have been greatly positive and many times I even enjoyed books more than Thea did in the first place. I have been dying to read The Magicians and Mrs Quent ever since Thea’s awesome review last year and was looking forward to finally reading it and when I finally got around to ….. This book did not work for me at all even though, in theory, it has ANA written all over it. Basically, just to recap: The Magicians and Mrs Quent is set in Altania, a world that resembles a lot England circa the Regency period, only with an extra helping of mythology and some magic and then there is a plot to bring down the King and THE DARK IS RISING or something like that. There is also a puzzle that needs to be put together by one of the characters. It is a book divided into three parts. Part one follows three characters (third person narrative), their dealings with each other and dealings with magick and it has a distinct similarity to Pride and Prejudice in writing and characterisation. Rakish Mr Rafferdy, the impoverished Mr Garritt and the bookish Miss Ivy Lockwell. Part two follows Ivy alone, in a first person narrative, recounting the time she spends away from her family in an Estate House in the countryside working for a brooding gentlemen (Mr Quent) as a governess to two children that are his relatives. This second part is Jane Eyre meets Turning of the Screw and is my favourite part in the entire book. Part three resumes the narrative as per part one following the same three characters but now with extra magick and this is where there is no “meet” anything and as Thea says it: this third part is wholly Mr Beckett’s. So, all the elements that I enjoy are there: a bit of Romance, a bit of Regency, a bit of Mystery, a bit of Fantasy, a bit of everything and perhaps that is the most glaring issue I had with the book: that there is a bit of everything but just not enough for me to enjoy. For example: yes there is romance. But it is not built in a way that makes me root for or feel for any of the potential couplings. I am told Ivy loves one guy and then next thing I know without really thinking about him after losing him, there she is falling for another one. No real FEELINGS that I could SEE. Then, the Regency – and I love me some Regency novels – bit is so similar to the books it pays homage to ( I say homage because it differs enough from the books I quoted above to make it so), that I didn’t see anything new or exciting about it. I felt bored out of my mind. It all moves so slowly and nothing really happens in part one. Part two is more interesting to me as a character-driven piece because it concentrates so much on Ivy but all the action concentrates on its third part and I think it is too much to expect from any reader: “just wait until part three! There is pay off! It’s only 350 pages till then, hang in there champ.” No, no sir. Another problem: it just so happens that when I am bored reading a book, I tend to nitpick. And that is never a good thing. For example, the length of the days in Altania alternate. Some days are shorter, some are longer, and they are always very different. And I am like: hey laws of physics! What kind of ORBIT COULD THIS BE? Of course, the explanation has to do with the use of magick but still I wondered. AND WHY WHY DOES IT HAVE TO BE “MAGIK”? What is wrong with “Magic”, pray tell? Or for example, one of the characters is decidedly gay. But he doesn’t seem to know it or doesn’t want to acknowledge it, which is fine since in this world it is an unlawful, abhorrent thing. But because it an unlawful, abhorrent thing, I expected some more DRAMA or CONFLICT after he kissed a boy, and totally liked it. Where is the drama? The feelings? I missed that… is it all hidden in book 2? Unfortunately I do not care enough to find out. So, there you have it. I wish I had liked this book as much as Thea did. That I felt so bored reading a book that is basically homage to Pride and Prejudice is VERY troubling because now I have this weird feeling that I would not be able to read Austen again any time soon….I tried to read Emma a few months ago and felt super bored too. So this is where I say: if you like your Regency still, if you like your Austen, plus all the other elements, you might not be as bored as I was and enjoy it like Thea did. YOU DECIDE! Rating: I do not know how to rate this book. Seriously. I can see its strengths but my personal experience with it was definitely not a good one. Like Ana, I always look forward to our “What She Said” segments (in particular, since Ana tends to hijack books that we are supposed to do as joint reviews and I’m left by the wayside), and N.K. 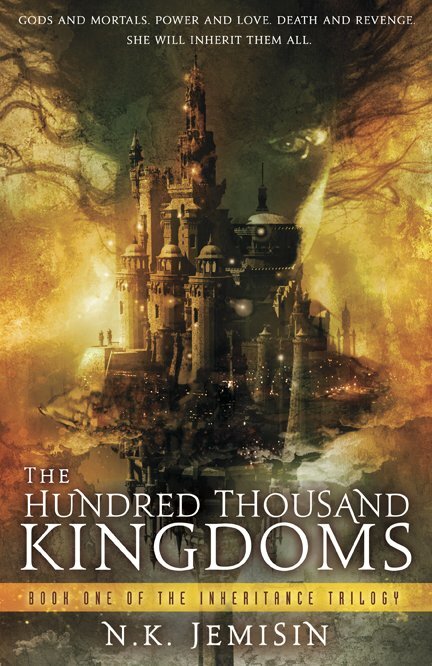 Jemisin’s The Hundred Thousand Kingdoms had been on my radar for just as long as it had been on Ana’s (never mind that Ana got and hoarded the review copy. Ahem). And, given Ana’s emphatic praise and visual emotional response to the book (what with hearts being torn out and all! ), I was ecstatic to finally get a chance to read this book. And, you know what? I liked it, quite a bit. Although the book didn’t resonate with me as much as it did with Ana and I had a few issues with character and the oh-so-standard Paranormal Romancey angle (which I wasn’t expecting at all! ), The Hundred Thousand Kingdoms is a well-written fable with an intriguing mythos, a beautifully rendered world, and solid plotting. The story is basically thus: Yeine is summoned to Sky, the capitol of the hundred thousand kingdoms, by her grandfather Dekarta, the over-ruler of all. Dekarta is near death and has three potential heirs – and Yeine has become one of them. Yeine accepts, but only because she has her own agenda in Sky, to avenge her murdered mother – whom she believes Dekarta had killed because of her mother’s abdication nearly twenty years prior. What Yeine discovers in Sky is a city based on blood and caste, with enslaved gods and treachery. Yeine struggles to solve the mystery of her mother’s death and to stay alive long enough to have her revenge, but makes some frightening discoveries about herself along the way. Yeine, a “little pawn” in a game started long before her birth, must ally with the gods if she is to save her homeland and have any chance at completing her task in Sky, offering her own life as sacrifice. What I loved most about The Hundred Thousand Kingdoms lay with the storytelling and the mythology of the world and its gods. The book takes a sort of Grecian origins mythos, with three original gods – Nahadoth of Change/Chaos, Bright Itempas of Rigid Order, and the murdered Enefa of Creation/Balance – spawning child gods (from wisdom to war) and creating life and humans. The tensions and relationships between these characters are palpable things, and I loved that each god actually *felt* like a god (as opposed to sounding like every other human in the book). The overall pacing of the story was well done, coming together in a dramatic – if not completely unpredictable – conclusion. Also, the manner in which the story is told, narrated by Yeine, including backtracking and asides, is a device that I enjoyed very much. Finally, there’s a running theme of daughters avenging their mothers throughout the book, a very maternalistic centrality, that I thought flatout rocked. We always hear about the daddy issues, and it’s cool to see the mother-daughter dynamic – especially in a fantasy novel. So, on to what I wasn’t so impressed with. Besides the fact that Yeine is “ugly” (short, stocky and plain), she’s quite the Mary Sue. She does the right thing, she’s protective of her people, she sacrifices her own life to make peace, even the gods love her, etc, etc, etc. Needless to say, I didn’t feel much of a connection with the protagonist. My other main complaint is that Nahadoth and the romance angle feels extremely traditional paranormal romancey – Nahadoth is the dark tortured brooding god that falls for a mortal (for reasons that don’t really fly with me), there’s lots of lusting and aching blahdiblahdiblah – and this is not my cup of tea. But, to be fair, this angle probably works to The Hundred Thousand Kingdoms‘ credit, as it can win crossover PNR readers and appeal to a nice, large audience. My only other problem – and it’s a little nitpicky – was in how some phrases that Yeine or other characters in Sky would utter felt modern and jarringly out of place with the tone and setting of the book. Ms. Jemisin clearly has imaginative scope and a knack for telling stories, letting them unfold organically – but the actual wordsmithing isn’t quite up to par with the rest of the book’s strengths. But, that just means there’s room for improvement! I’m excited to see where book 2 takes us, and I’ll definitely be back for The Broken Kingdoms. I always love “What She Said” segments! Thank you both- this gives me more information to go into my next bookstore run! Lovely feature — made me laugh. I appreciate the honest reviews, too. Fascinating that you both had such divergent opinions of The Magicians and Mrs Quent! LOVE this feature. And now I want to read Hundred Thousand Kingdoms even more – the “daughters avenging mothers” aspect alone has me intrigued. I love this feature too! Hm, it’s interesting how people keep mentioning the paranormal romance aspect of The Hundred Thousand Kingdoms. I certainly noticed there was a decent amount of romance when I read it, but I guess I just liked the world mythology and narrative style so much that I didn’t really focus on it as much as the other parts. But if that part of it bothered you somewhat, you may find The Broken Kingdoms is a bit more to your liking. I still need to read The Magicians and Mrs. Quent too. It’s been on the TBR for a while now. These are both waiting on my TBR pile, and after reading your original reviews and this “what she said post”, I’m even more looking forward to reading them. Although I hope The Magicians and Mrs. Quent won’t bore me as it bored you Ans! *sigh* Hundred Thousand Kingdoms did not work for me and I really wished it had. But the whole Yeine and Nahadoth angle fell so flat for me. I couldn’t buy it. The immortal god and the Mary Sue. Ah, well. I felt the same way with Mrs Quent. I really wanted to enjoy it but it bored me. Too much of everything and I couldn’t connect with any of the characters.